Once you write the final paragraph of a formal letter, you may feel like you're done and can move on to proofreading. 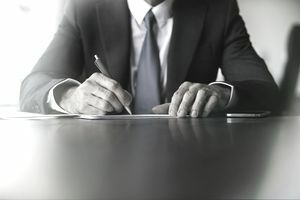 But just as there is a style to how to address someone in a formal letter and for the letter's overall format, there are also guidelines in place for how to sign off. When ending a formal letter, it's important to convey the appropriate amount of respect to the person receiving the letter. For example, you would use a different, more conservative complimentary close for an unknown recipient than you would for a business associate you know quite well. Your closing and signature should be as professional as the rest of your letter or email message. A complimentary close, also known as a complimentary closing, is the term inserted prior to your signature in an email message or a formal letter. This sign-off phrase shows your respect and appreciation for the person who is considering the request in your letter or email. Although it is a very old-fashioned tradition, using a complimentary close is still considered de rigueur when writing formal business correspondence. When writing or emailing a cover letter for a job or any type of business letter, it's appropriate to use a complimentary close. Make sure to choose one, though, that is professional rather than casual. All of the options listed above are appropriate for use in business correspondence. Choose which one to use based on how well you know the recipient and the circumstances behind your letter writing. For instance, limit options that are some form of a thank you (such as "With appreciation" and "With gratitude") to instances where you are requesting a favor or expressing appreciation. You can think of "Best regards," "Sincerely," “Cordially,” and the variations on these closers as the little black dress of complimentary closes. You can't go wrong choosing one of these options—they're always appropriate. You are not emailing with a friend or sending a thank you note to a relative. Do not use casual sign-offs like "Love," "Cheers," “Later,” “Ciao,” or "Always." These options do not match the formality of your letter. You want to keep the professional tone of your correspondence consistent, from the salutation through the content through the sign-off. Always remember to follow up the close with a comma, as in the examples below. Your typed name will go after the complimentary close. If you are sending a hard copy letter, leave four lines of space between the closing and your typed name. When you print out the letter, this will give you plenty of space in which to sign your name in blue or black ink between your complimentary close and your typed name. If you're sending an email, leave one space between the complimentary close and your signature. You can write your title below your name, as well as your phone and email address. In emails, you can include an email signature section with contact information. After you finish writing a letter, of course, always proofread it for spelling, grammatical, and punctuation errors. In order to make a good impression, your letter needs to be flawlessly constructed. Are you still unsure about what should be included (or not included) in a formal letter? From appropriate formatting to how to address the letter, find out tips and guidance for writing a formal business letter.